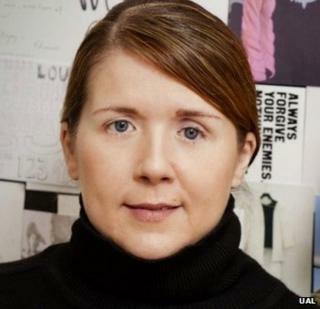 Louise Wilson, a leading figure in the fashion world who influenced top designers including Alexander McQueen, has died aged 52. The head of Central Saint Martins college, where Prof Wilson was director of the prestigious MA Fashion course, said she had been "inspirational". Fashion industry figures called her a "legend" and a "genius". Prof Wilson was appointed OBE in 2008 for services to education and the fashion industry. She became course director at London's Central Saint Martins in 1992, teaching students including Christopher Kane and Roksanda Ilincic who went on to become renowned designers. Prof Jeremy Till, head of the college, said she had taught "a huge proportion of the world's leading fashion designers". He said: "Her commitment to her students and passion for creative excellence are legendary. Her deep understanding of fashion and her drive for funding for bursaries, facilities and opportunities are part of what made her such an extraordinary educator." Prof Wilson's legacy would live on through her former students and colleagues, he added. Caroline Rush, chief executive of the British Fashion Council, wrote on Twitter: "Prof Louise Wilson, I can't believe you have gone. You were much loved and respected. A legend and an inspiration. RIP". Fashion journalist Hilary Alexander also paid tribute, saying Prof Wilson was a "genius" who would be missed. Alexandra Shulman, the UK editor of Vogue magazine, said Prof Wilson had "played a remarkable role in making the British fashion scene as successful and relevant as it is today". She added: "Her teaching and influence made a mark on so many of our leading designers. I will miss her outspoken views and her clever and often very funny observations."